Gil Kane -- the man who was best known for revitalizing the golden age heroes of The Green Lantern and The Atom passed away Monday morning (1/31/2000) in his Florida home after a long battle with cancer. Eli Katz (his birth name) was born in Latvia on April 6, 1926 but his family emigrated to New York in 1929. He was an avid reader of comics & pulps and broke into the comic field in 1941 as an assistant in the Jack Binder shop erasing pencils. Soon after, he began inking and penciling and started to draw comics for MLJ, the publishers of "Archie," working on such characters as the Scarlet Avenger. During the early years of the WW II, Gil worked for Joe Simon and Jack Kirby at Timely but then moved on to National Periodical Publications -- also known as DC. In 1944, he joined the army and upon his return, went back to DC drawing Wildcat and The Sandman. Through the 50's, Gil continued to do free-lance work but maintained a steady relationship with DC, illustrating everything from mysteries and science fiction to Rex the Wonder Dog, as well as, his personal favorites -- westerns. In 1956 DC editor Julius Schwartz let artists Joe Kubert and Carmine Infantino revive the golden age character, the Flash. Jack Kirby then introduced the Challengers of the Unknown, followed by several other new super heroes, including Adam Strange in "Showcase Comics #17," illustrated by Gil Kane. 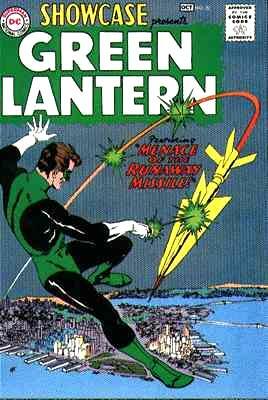 What this would all be leading up to is "Showcase #22" which re-introduced another golden age character -- The Green Lantern. SH 22 was to become one of the most popular books of the silver age era and within a few years, Gil helped re-introduce another GA hero, The Atom in "Showcase #34." This book was equally well received and though Gil was head artist on two super hero comic titles (plus a slew of other sci-fi and fantasy stories for DC) he also produced art at Tower Comics on Thunder Agents, at King on Flash Gordon, plus freelanced at Marvel as well. He finally left DC and Green Lantern with issue #61 (though he came back to do issues 68-75). His last issue of the Atom was #38. During the 60's at Marvel, Gil worked on the Hulk, Conan, Captain Marvel, Spider-Man, Captain America, the Avengers and many others. In 1971, Gil wrote and illustrated the "first" Graphic novel titled Blackmark -- a sci-fantasy epic. During the early years of the seventies decade, Gil created Morbius the Living Vampire in Spider-Man #101 and Iron Fist in Marvel Premiere. The late 70's/80's, saw Gil return to DC working on various titles and his involvement in the development of cartoons for Hanna-Barbera. Most recently, despite his illness, Kane kept busy illustrating "The Edge" for Malibu and was working with Alan Grant on a number of different projects, including a two-part Green Lantern story guest-starring the Atom for "DC's Legends of the DCU" which is in March's issue (#28) and concludes in #29. Gil was also working (w/ Grant) on a hardcover Superman graphic novel at the time of his passing. All heads hang low in the fabled world of comicdom this week for the passing of one of the greats. Gil Kane -- he was 73.